Today we launched our next strategy Think to Drink - Drink to Think. The ‘Think to Drink: Drink to Think’ programme is part of a project which aims to foster an environment that supports children following the Canterbury earthquakes. The experience of these earthquakes may have caused stress therefore taking care of one’s body is an important way to help cope with stress. 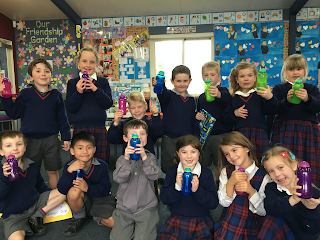 In class your child will be given a free drink bottle so that they can increase their water intake in the afternoons. This bottle is NZ made and BPA free. In class they will learn about the importance of staying hydrated for their mind and body. We have provided you with some basic information so that your child can come home and tell you what they have learned. Why do we need to think about drinking? Studies show that many children, from both hot and cold climates, are often dehydrated when learning at school. Being adequately hydrated has been shown to improve short-term memory and kidney function, which may make bed-wetting less likely to happen. Hydration is simply having enough water in your body. Being hydrated simple makes you feel better and think more clearly. Dehydration may result from inadequate water intake and/or from losing body water and can develop rapidly or slowly. Symptoms of mild dehydration can be difficult to spot. By the time children get home from school many are complaining of tiredness or headaches and some may be too lethargic to do anything but slump in front of the television. Although we may think of this behaviour as normal, it is now known that it may, at least in part, be due to the effects of dehydration. The standard recommendation is 5 glasses (1 litre) for 5 to 8 year olds, 7 glasses (1.5 litres) for 9 to12 year olds, 8 to 10 glasses (2 litres) for 13+ years. What effect does drinking water have on thinking? Water makes up about 80% of the brain and is an essential element in neurological transmissions. Staying hydrated positively affects a child's mental performance, learning ability, and helps to cope with stress.